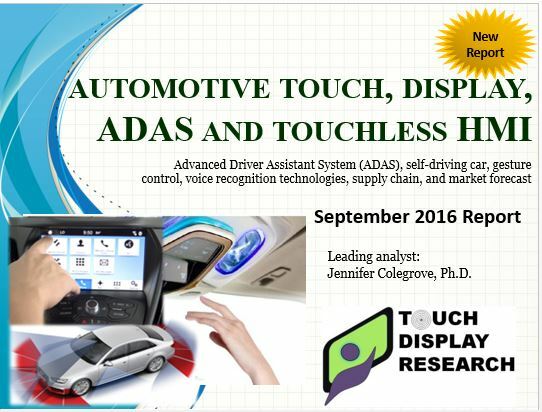 Press Release-Touch Display Research Publishes 2016 Automotive Touch, Display, ADAS Report - Touch Display Research, Inc.
Santa Clara, California, September 12, 2016— In the recently published “Automotive touch, display, ADAS and touchless HMI 2016 report,” Touch Display Research Inc., a market research and consulting firm, analyzes automotive touch scren, display, ADAS (Advanced Driver Assistant System), and touchless human-machine-interaction (HMI). More than 500 companies working on automotive technology are profiled in the report, which includes over one hundred automotive companies, over two hundred touch screen companies, over two hundred touchless human-machine-interaction (HMI) companies, and about thirty display companies. This report covers four parts of automotive technologies: touch, display, ADAS, and touchless HMI. Source: Touch Display Research, Automotive touch, display, ADAS, and touchless HMI 2016 report. Colegrove, author of this report, has conducted many first-hand surveys and interviews with touch panel suppliers, display suppliers, touchless sensor suppliers, automotive system integrators, and automotive brand companies in the past several years. This report includes a PowerPoint file of over 380 pages and an Excel database. Market data in the report includes 2015 history data and forecasts from 2016 to 2023. The touch for automotive market forecast includes Unit, module ASP, and Revenue, with a detailed breakdown by projected capacitive touch (discrete), in-cell on-cell, resistive, and other touch technologies. The display for automotive market forecast includes Unit, module ASP and Revenue, with a detailed breakdown by TFT LCD, AMOLED, PMLCD, PMOLED, other displays, and heads-up-displays. The touchless HMI for automotive market forecast includes Unit, module ASP and Revenue, with a detailed breakdown by ADAS (LiDAR, radar, ultrasound, camera), gesture control, eye-tracking, voice command, proximity touch, and other touchless technologies. Touch Display Research experts have been writing touch, display and touchless sensor industry analysis reports for over ten years. You can access this expertise by purchasing and receiving the report today. A license for less than five users is $6200 for this report. The license for five or more users is $6900.